Lucifer's Crypts are multiple sites that Lucifer created to hold special weapons and artifacts. The locations of the crypts were lost over time to all except his closest followers. The crypts at some point were visited by Azazel and Meg. One of the crypts located in Lincoln Springs, Missouri, contained the angel tablet which was placed inside a box engraved with angel warding sigils. According to Wendy Rice, a PhD Candidate who located the crypt at the intersection of Downey and Bond Street, it was previously known as the "Jakubiak Orchard." Upon learning of the angel tablet's existence, Crowley orders his demons to go in search of it. His findings lead him to discover that the angel tablet is located in one of Lucifer's Crypts, and he orders his demons to find the crypt holding the angel tablet. The demons do this by possessing people who may contain special information on the whereabouts of the specific crypt and Crowley tortures Meg who visited all the crypts during her time with Azazel. 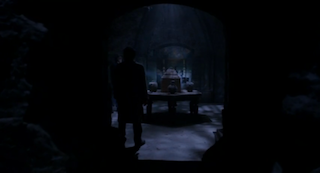 After Dean, Sam, and Castiel, with the help of Meg, discover the location of the crypt holding the angel tablet, Dean and Castiel go ahead to retrieve it while Meg and Sam stay behind and keep watch to stop any demons coming through. After Castiel notices that the entrance to the crypt is blocked by a wall, he uses his angelic powers to shatter the wall. Dean goes through and Castiel points out to Dean where the angel tablet is stored; he cannot retrieve it himself because the box is engraved with angel warding sigils. 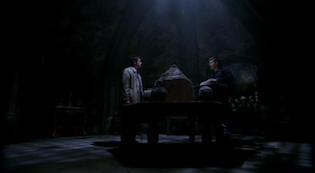 After Dean removes the angel tablet from the box, Castiel asks Dean to hand it over so he can return it to Heaven but Dean, having been suspicious of Castiel for awhile, tries to manipulate his way out of it. Castiel, under the control of Naomi, is forced to attack Dean. After a brutal bashing, Castiel struggles to land the finishing blow. Castiel, after picking up the angel tablet, regains control of himself and apologizes to Dean. Castiel explains that Naomi has been controlling him ever since she got him out of Purgatory and that the angel tablet broke her control over his mind. Before leaving he heals Dean and tells him that he must protect the tablet from Naomi, Crowley, and even Dean himself. Later on, inside the crypt, Naomi and Crowley have a chat about the situation at hand. Before Crowley can make a deal with her, she leaves, much to Crowley's amusement. 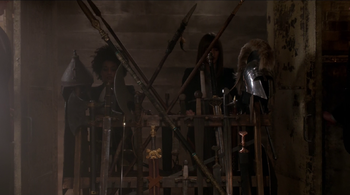 In Crowley's Lair, demons bring Lucifer a selection of weaponry from his crypts which he is shown to be displeased with. A fossilized feather from Lucifer's wings, excavated from one of Lucifer's many crypts by an unknown seller, is used to summon Lucifer, as well as temporarily rejuvenate his vessel. This page was last edited on 3 October 2018, at 20:59.